Note: Silicon Valley is defined as Santa Clara, San Mateo, San Francisco, and Alameda Counties. "Total requested workers" includes certified LCAs for subsidiaries and related businesses. Due to errors and omissions associated with administrative data, results should be interpreted as conservative estimates. 1. Companies wanting to hire higher-skilled guestworkers must first receive a certified Labor Condition Application (LCA) from the U.S. Department of Labor. Not every certified LCA application will necessarily become a hired guestworker, but the absence of more precise publicly available government data makes LCA certifications the best proxy to measure guestworker employment. 2. As determined by total approved I-129 Petitions, fiscal 2010–12. Companies include Cognizant Tech Solutions, Infosys Ltd., Wipro Ltd., Tata Consultancy Services Ltd., Accenture, IBM Corporation, Deloitte & Touche, Larsen & Toubro Infotech Ltd., and HCL America Inc. See “The Impact of the H-1B Temporary Nonimmigrant Visa Program on Workers, Graduates, & the U.S. Labor Market,” Jobs With Justice. 3. Ron Hira, Bridge to Immigration or Cheap Temporary Labor? The H-1B & L-1 Visa Programs Are A Source of Both. Washington, D.C.: Economic Policy Institute, February 17, 2010. 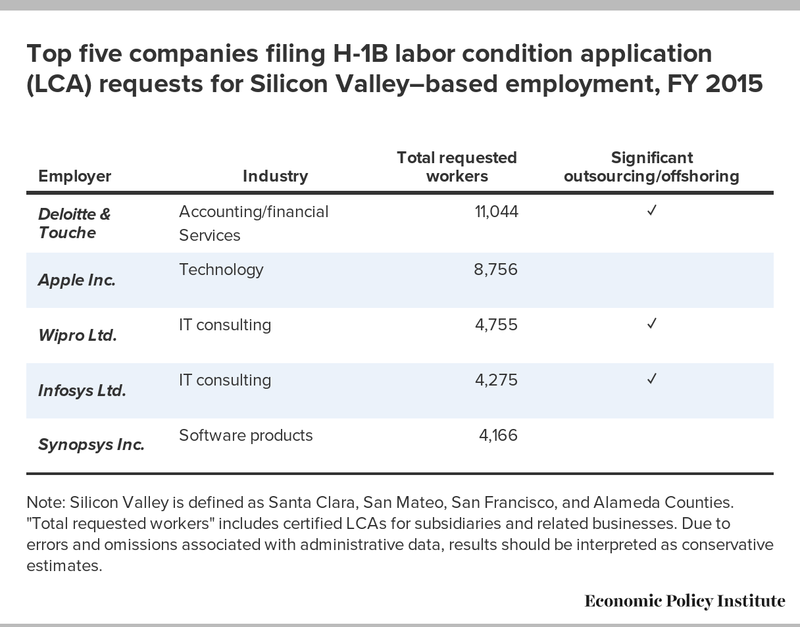 Also Ron Hira, “Top 10 Users of H-1B Guest Worker Program Are All Offshore Outsourcing Firms,” Working Economics (Economic Policy Institute blog). 4. 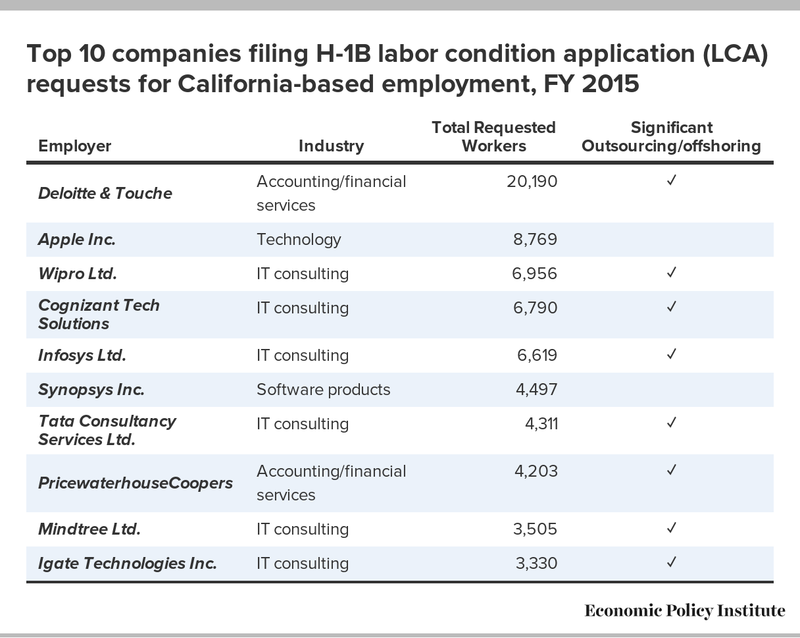 Patrick Thibodeau, “Southern California Edison IT workers ‘beyond furious’ over H-1B replacements,” Computerworld, February 4, 2015. 5. Ron Hira, “New Data Show How Firms Like Infosys and Tata Abuse the H-1B Program,” Working Economics (Economic Policy Institute blog), February 19, 2015.